Dining table, rosewood and chromed steel, Germany, 1960s This modern dining table features a rosewood table top and a chromed steel frame. The frame is executed in thin legs that and a frame that holds up the table top by only a some support points. This creates an airy, light lifted appearance. Another defining element of this table is the grain and colour of the rosewood. 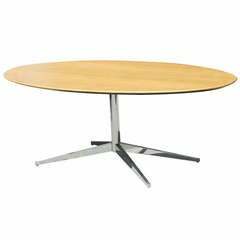 This model would be very suitable as a dining tale or a conference table. 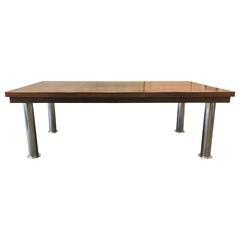 Mid-Century Modern rosewood and chrome conference table with cylindrical chromed steel legs.Industrial Table. Can also be used as a dining table. Gorgeous modern rosewood dining table with one leaf and chrome base made by Dyrlund. Dimensions taken with leaf in. Dimensions of leaf: 23.5 in W.